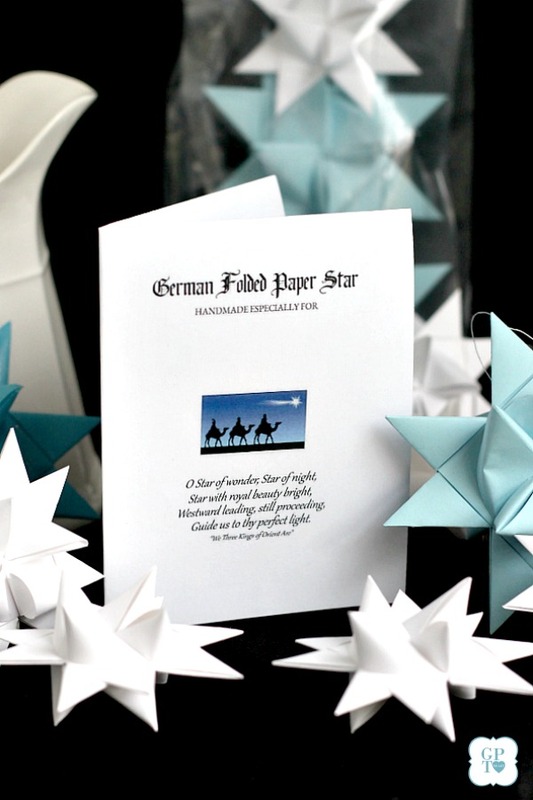 Do you recognize these folded paper German stars? Many folks remember making them as a child or seeing relatives make them. You might even have one or two from long ago. Would you like to learn to make them? Follow my video tutorial and I’ll walk you through the many steps one fold at a time. 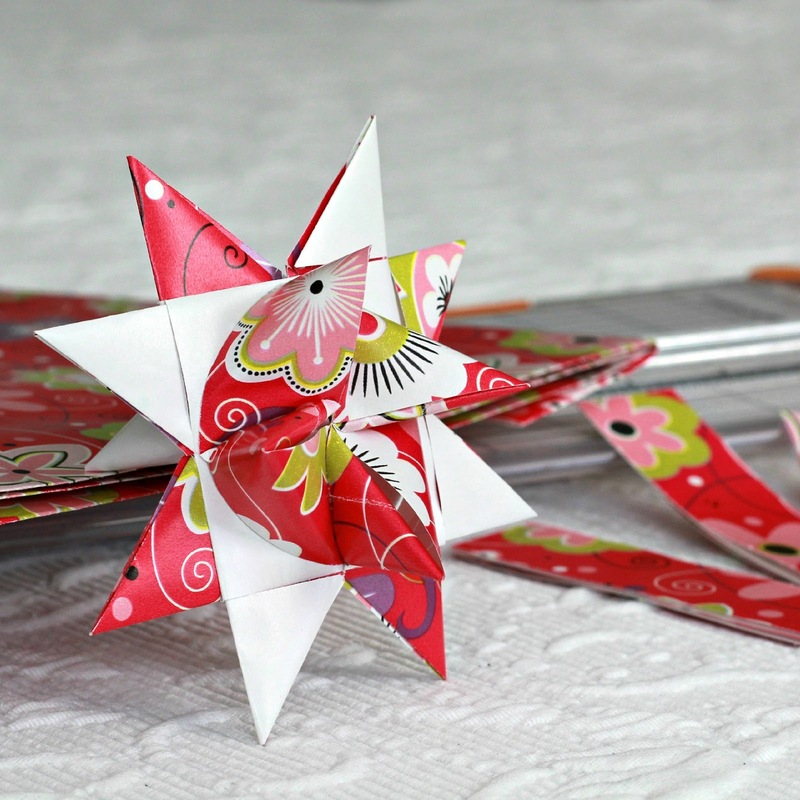 I made a tutorial for folded paper German Stars. 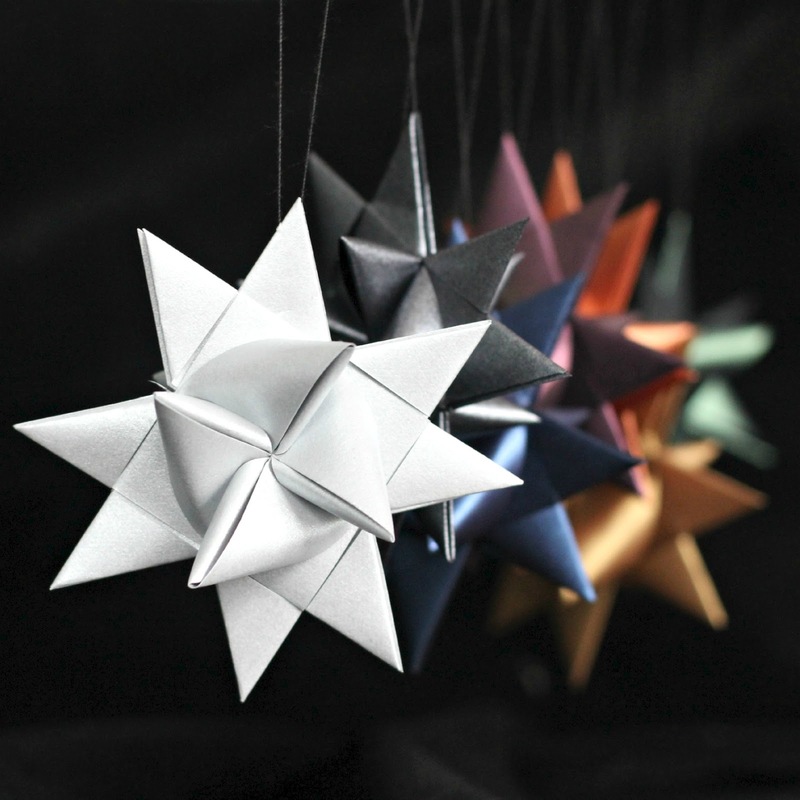 Sometimes they are called Moravian Stars or Froebel Stars. They are lovely as ornaments on a Christmas tree, make special keepsake gifts, and can be added to wreaths or just displayed in a pretty bowl. My favorite are the white stars but they are pretty in any color. Look how gorgeous they look in vivid colors. 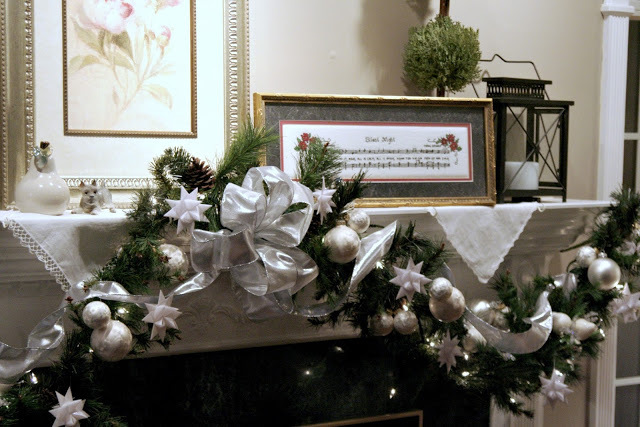 Tucked into the branches of a garland swag makes the mantle look so festive. and elegant. They are very pretty in bright colors too. These remind me of a quilt pattern. 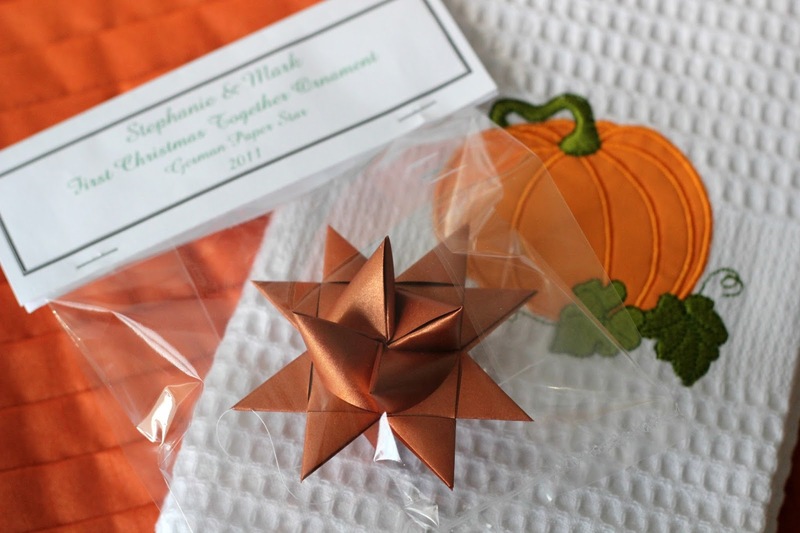 Make some stars in pretty colors and package up as thoughtful gifts. Use as a thank-you gift or hostess gift. 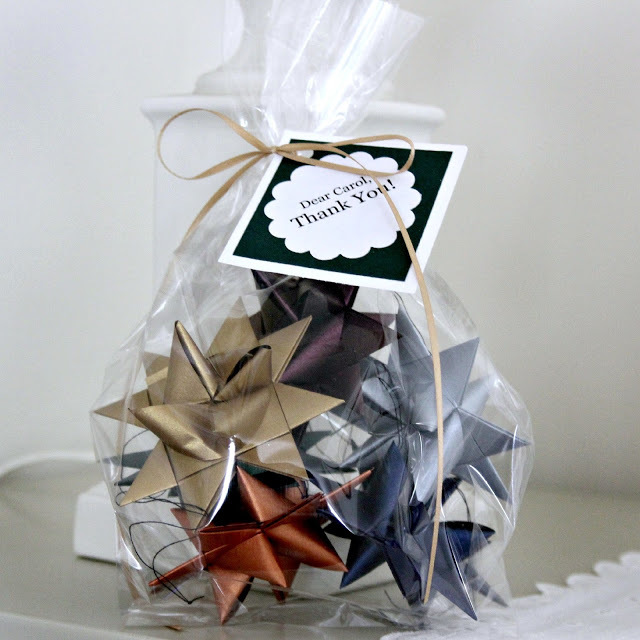 Use as a package bow, a shower favor or give as a 1st Christmas Together ornament. I have made the stars by cutting my own strips in various widths and lengths using wrapping paper and even newspaper comic pages. It is tedious cutting my own so I now purchase paper strips but you might enjoy experimenting. 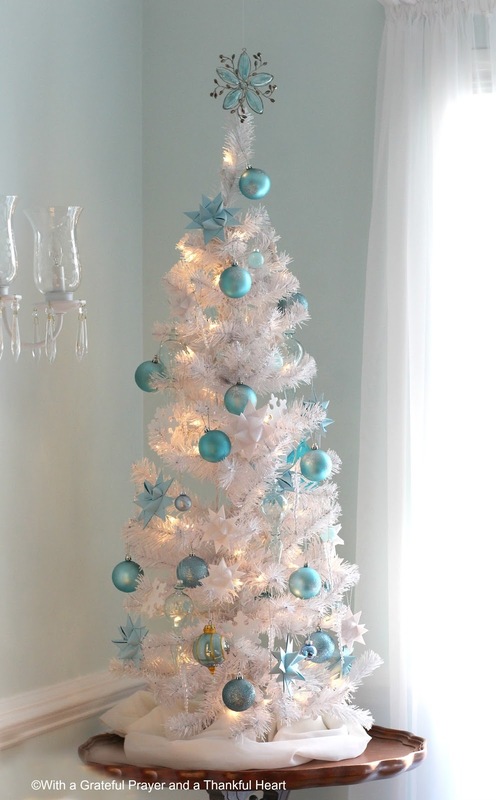 Stars in just blue and white adorn this tree. The white stars are waxed and the blue ones are not. Traditionally these German Stars were dipped in paraffin to help protect them from the outdoor elements. I displayed some on a tree on my porch and they suffered no ill effect. You can find the How-To process by clicking Dipping German Stars in Wax. 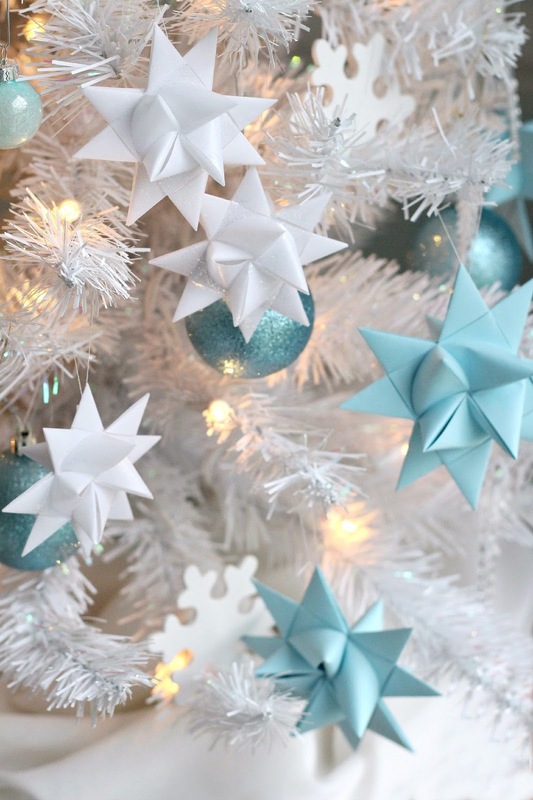 Where to find paper strips to make these lovely stars on Amazon. Thank you for sharing your tutorial. I have enjoyed making these!!! Pretty! Great tutorial was able to get the 3D points because of it. This is a wonderful tutorial. Thank you so much for your clear instructions and beautiful stars! Thank you so much for your excellent video tutorial. I recently made 50 of these as christmas gifts for my daughter's classmates. They were a big hit. I found your blog via betzwhite.com. I remember having a star like this on our Christmas tree when I was a kid, but I don't know who made it or where it came from. I was always intrigued by it. Thank you for the video tutorial and explaining and showing it ALL step by step. I do have one question I did not see answered. Does the length of strip vary with the width of the strip or is it always 25 inches long? OK, I have to try these. I made Polish Porcupine Balls a couple of years ago. The star is beautiful and the videos are perfect!!!! (from Buenos Aires, Argentina). Many years ago my aunt made dozens of these. I love them! The wax kept them nice for many years. Thank you! Guiding us through these steps made our Sunday afternoon wonderful. My kids loved making these stars. Thank you so much for the tutorial,it is so easy to follow. And your stars are beautifull. Realise that this is a super late comment to your post but I just found it while looking for German stars. I love your tutorials – have you thought about using quilling papers. They are very thin but I have found them in a variety of widths and they work brilliantly for the Japanese stars and other paper crafts that I have tried. Cheryl ~ I have not used scrapbook paper so I am not sure. I wonder if the thickness might be a little hard to work with but you can give it a try. I have used tiny pieces of tape with success to make longer strips of paper. I did not overlap them because I think a bulge would not slide easily through the folds. can you use scrapbooking paper and can you glue the strips together with a glue sticks? You know I've had 3 Christmases here in Germany and I never knew what those stars are called, I can't wait to try this for our last Christmas here, good thing I'm seeing it in February – I'm not the most talented crafter! I read about your tutorial on another blog. How fabulous it is! LOVED trying this out, and the instructions are so clear, I could follow with just a few pauses. I am thrilled to have found this website! 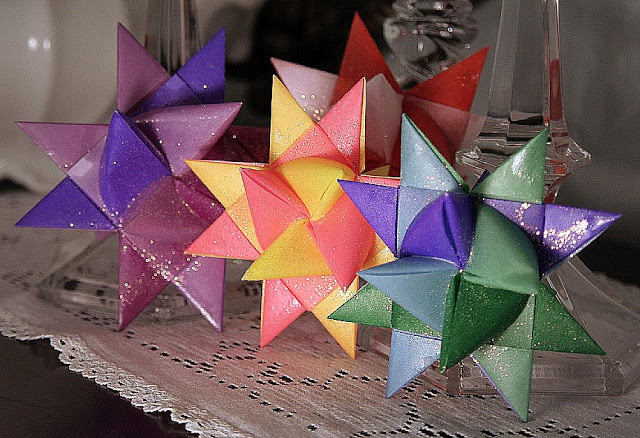 I was searching for German star instructions…my friend's Mom made these when I was a child (I am 63)and I have had them in my memory all these years. I had another set of instructions which did not have a video;yours are the best! 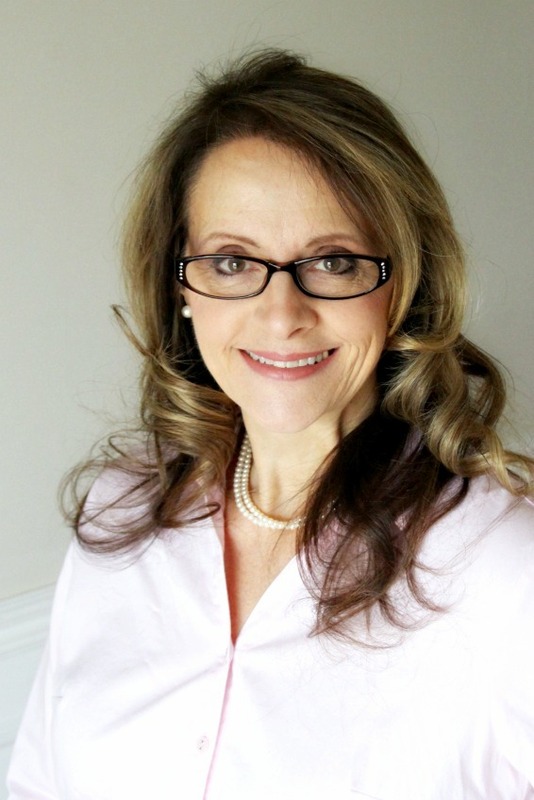 God Bless you and your beautiful family…I also have 4 children and 9 grandchildren. The interests you describe sound like me! Thank you for such a well laid out tutorial! I love learning how to decorate in traditional ways, and recycle at the same time (I used magazine pages). These look lovely and the fact that they are a German family ritual blesses me as I use them to style up my place for Christmas. Like so many here, thanks for the well done tutorial. Written directions are so confusing, and your video puts things into perspective. Size, pace and well given step-by-step directions were very clear! I use this make these stars at elementary school but I forgot how to make them. So thank you for making this tutorial, it was very helpful. Thank you for the tutorials! I was born in Norway and these stars are what my parents decorated our Christmas trees with for the first few years. (They were teachers in an American school so there was ample paper, but not much else). 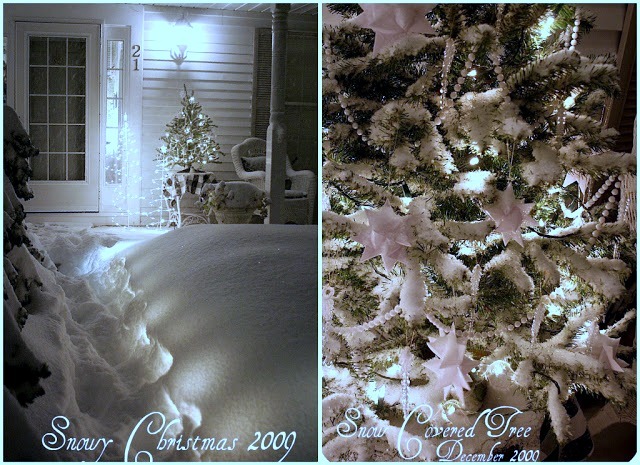 I can't wait to try to make a few of these for my tree this year. Thanks so much! Thank you very much for take the time to do this tutorial, the stars are very very beautiful, congrats! I just found your blog! I have received a star in a swap made from material and all the instructions I found were hard to understand. Your tutorial looks excellent! Will be a definite ornament for people this year. TFS! Now, this is going to age me….but I made these in grade school…some 50 years ago. And, I've told my husband about them…never to be able to find the 'how' until now!! Precioso la estrella los felicito he visto el video,no se las medidas pero voy a tratar de hacerlo(no sé inglés) GRACIAS POR COMPARTIR el tutorial les escribo desde Lima Perú. y que reciban bonito el AÑO NUEVO 2010 un abrazo para toda tu familia. I just saw your stars and tutorial on your blog. They are beautiful. I have made the stars for gifts in the past using gift wrapping ribbon rather than paper. You can get so many colors and textures, as well as sizes. The iridescent ribbon is gorgeous but hard to see as you are working. i have never dipped them in paraffin- it does make them look nice. I don't have a blog so wasn't able to add my comment to your post. You can add it for others to read if you like. I would love to win a set- especially the white or multi-colors. These are beautiful. I made these as a teenager, but forgot how. Thanks for the reminder! Hmmm .. do you think these would work if they were made with starched strips of fabric? I enjoyed the tutorial and I am anxious to try doing one of these. I think I like the blue ones best. I made these stars 15 years ago, but I used white ribbon instead of paper. I still hang them on the chandelier over our dining table every Christmas. The year that I made them, I made extras and when a guest commented on how beautiful the stars looked, I removed one and gave it to them as a gift. I was searching for instructions on how to make them again when I discovered your site. Thank you for refreshing my memory with your tutorial and the idea to use paper. May your Christmas be filled with joy and love! I would love the white stars, they are so elegant. Thanks for the tutorial. Thank you so much for sharing – these stars are lovely, I just made one from your very clear tutorial. They look so complicated and you make it so simple. 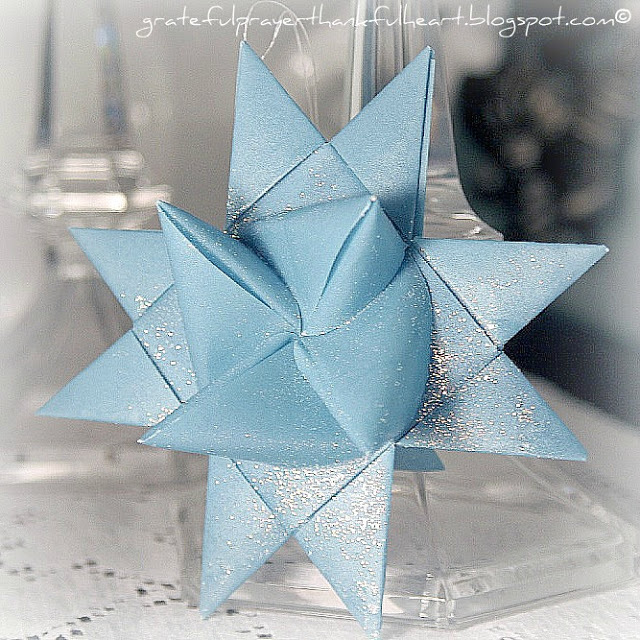 Please enter me in your folded star ornament giveaway. I don't know how I missed seeing this before now! Thanks for mentioning mine on your blog! Thank you so much for the video tutorials you created. They made it so easy to learn how to fold these stars. The stars are gorgeous and pretty easy to make once you get used to the steps. I've made about 10 in the last couple of days of varying sizes, colors, and papers. I'm making ornaments out of them to give to friends this Christmas. And thanks for the refresher on these stars. Your blog is wonderful, I don't have a blog but love learning new things reading all of the wonderful ideas around. God Bless & Merry Christmas. I would love the have the multi colored stars. In the mean time, I'll give it a try and fold some stars. Lovely, I am from Germany and haven't seen these since leraving home. I would LOVE to enter your giveaway!! in my life!!!! I praise God for you! I love your beautiful handiwork! I would choose the white stars… Also, I love your blog song, "Ancient Words". Thank you! This is the first time I have visited your blog. I have just started this journey – so congrats! on your 1 year anniversary. You star ornaments are truly beautiful – I have just become a follower and will post a link on my blog. I know this is a busy time of the year – but if you feel like stopping by and saying hi, please do so. I clicked over here from One Pretty Thing & I'm sure that I'll be visiting you again! I like the dark purple/aubergine stars the best, but all are beautiful & I'll be trying to make them for myself, too. Thank you for the videos! btw..thanks for posting this *early*…such wisdom in doing that…!!! What a blessing your blog has been to me! I'm so grateful I found you! Happy Anniversary and I hope you have many, many more. I would love the blue stars!!! But more importantly, I'm just glad to be a part of your blogging world!!! Enjoy your day! CONGRATS! I think I am getting close to a year blogging myself. May have to do a giveaway soon myself. The stars are lovely. I love all the colors, but the white is my favorite. I love these stars. Thank you sooooo much for putting up the tutorial. Hopefully I can get a chance to make some. Where do you get paper that is 25 inches long? Craft store I am assuming? I posted a link on my blog and of course I am already a follower. Love your blog! That is so kind of you to share such a wonderful craft with us. 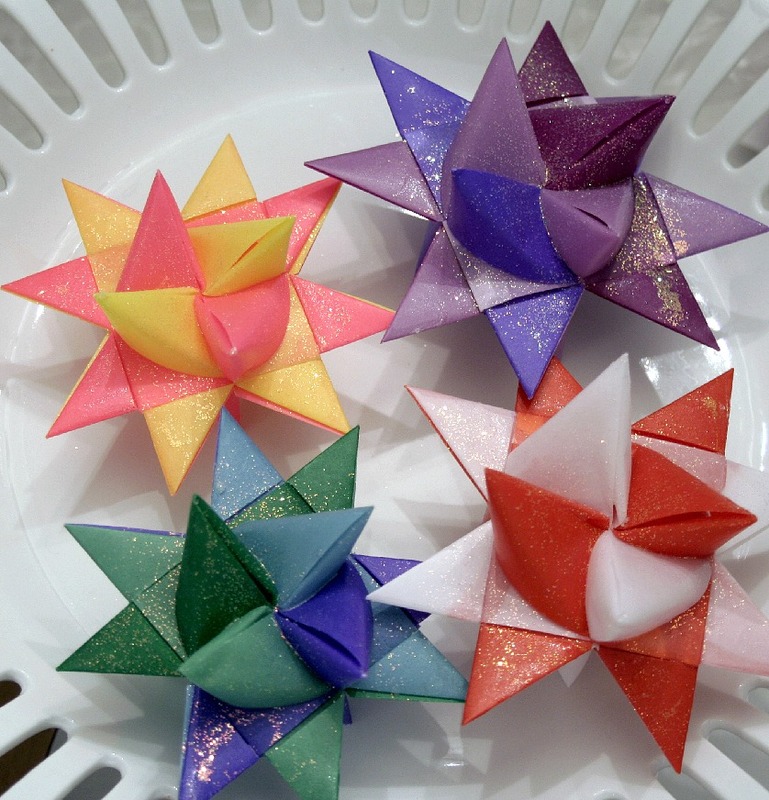 I have always admired those kinds of paper stars and wondered how they were made. Now I know! Of course I would love to enter your giveaway! The stars are gorgeous and you are so generous to give away so many! I love them all but I think the white ones are my most favorite! I am already a follower and I am putting your giveaway on my sidebar! O.K. it looks like I'm the first. That's what I get for being awake at this time of day. I think I like the white stars best even though the other colors are fun as well. I am already a follower. I like your blog a lot. And, I have posted about your giveaway on my blog. Hey I just glanced over and realized that you have four daughters…so do I!